For generations, we were told that marijuana was a demon drug that would turn people into lazy, violent and dumb drug addicts. The propaganda about this substance has been relentless. Over the years, however, as more users began to come out about their experience and more scientific studies were conducted, people began to understand that many of the myths were untrue. After Colorado legalized Marijuana just a few short years ago, the world was finally given some evidence to be able to determine whether or not the propaganda was true. Since prohibition has ended in certain areas of the US, the Free Thought Project began compiling stories that debunk the “reefer madness” propaganda that has infected American culture for nearly a hundred years. Below is a list of debunked claims highlighting how the war on drugs is built on lies. Violent Crime Is Down Since Cannabis Legalization – According to statistics released by the government in Denver, the number of robberies and violent crimes significantly decreased since marijuana legalization went into effect. It is important to mention that this strong correlation is not definitive proof that legalization is the cause of this drop in crime, but it does strongly suggest that this is the case. These statistics are especially convincing considering the short amount of time that this drastic reduction in crime has taken place. In just one short year, the number of homicides dropped by 52.9%. Sexual assaults were reduced by 13.6%. Robberies were down by 4.8%, and assaults were down by 3.7%. The statistics measured the first few months of the year for both 2013 and 2014 and then compared those numbers with one another to determine whether they were higher or lower after legalization went into effect. This result was in complete contrast with the predictions of the fear mongering drug warriors. New Study Shows Legalization Prevents Underage Drug Use – According to a recent study on marijuana legalization, use among teens has actually dropped in states where the herb is no longer prohibited. The study took data from over 1 million teens from various states, over the course of 24 years. Dr. Deborah Hasin, professor of epidemiology at Columbia University Medical Center, explained the study in a recent interview. “Our findings provide the strongest evidence to date that marijuana use by teenagers does not increase after a state legalizes medical marijuana. Rather, up to now, in the states that passed medical marijuana laws, adolescent marijuana use was already higher than in other states. Because early adolescent use of marijuana can lead to many long-term harmful outcomes, identifying the factors that actually play a role in adolescent use should be a high priority,” Hasin said. The study also found that marijuana use is down among 8th graders in the states where it is now legal. 8th graders represented the youngest group in the survey and the most well-adjusted to marijuana legalization. This is actually not the first study to come to this same conclusion. Back in 2012, another study entitled, “Medical Marijuana Laws and Teen Marijuana Use” also found that the legalization of medical marijuana in the state of California did not increase drug use among teens. These findings entirely contradict the hysteria of the drug warriors who claimed that legalizing pot would lead to children addicts. Study Finds Prescription Use Down After Legalization – According to a demographic review of patient characteristics published online in the Journal of Psychoactive Drugs, people who use marijuana to treat a variety of different conditions are less likely to turn to other prescription drugs. It is no wonder that the pharmaceutical industry is one of the largest contributors to the lobby for perpetuating the drug war. They cannot compete with a natural medicine which can be grown in one’s own yard. Highway Car Accident Deaths Are At Their Lowest Ever In Colorado – According to data released from the Colorado Department Of Transportation the roads safer now that marijuana is legal. The graphs below, published by The Washington Post show how drastic the decrease in fatalities has been since legalization. This reduction in fatalities is in spite of police who fear mongered that legal weed would lead to an increase in traffic accidents. Rapid Economic Growth And Opportunity Since Legalization – As reported by The Denver Post earlier this year, Colorado employers added more jobs in June than they have in any single month since official counts began back in 1939. As expected, the population has also grown in Colorado now that there is more freedom and more opportunity. According to the report, since legalization went into effect the average numbers for paychecks are also higher. Compare this increase in the labor force with the lies about pot making you lazy and unmotivated and the establishment’s claims about reefer seem nothing less than actual madness. According to The Colorado Department of Revenue, the state government was able to rob marijuana sellers and users blind, collecting over $70 million in taxes from cannabis sales. Meanwhile, alcohol companies were fleeced for roughly $42 million for alcohol taxes, over the course of a year. While businesses being looted by government tax collectors is never anything to celebrate, it is interesting to see how quickly the marijuana market is growing. Mason Tvert, director of communications for the Marijuana Policy Project recently said that the state was able to collect so much money in taxes that they are getting a break for one day. With all of this evidence, it becomes clear that the citizens, in states where police can kidnap, cage and kill them for this plant, are nothing short of oppressed. When a person would deprive another human being of their life and liberty for their personal choice which harms no one, they become the criminal. Legislation is no measure of morality. The only thing a marijuana user has to fear from using marijuana is the state. It is time to end the war on drugs. 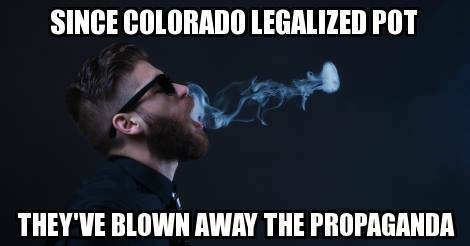 Share this article with your friends and family to show them the astonishing power of ending prohibition.